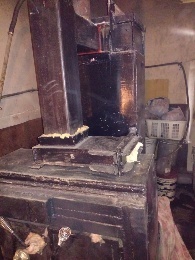 Wood gasifier heating stove boiler type - Off Topic - Drive On Wood! 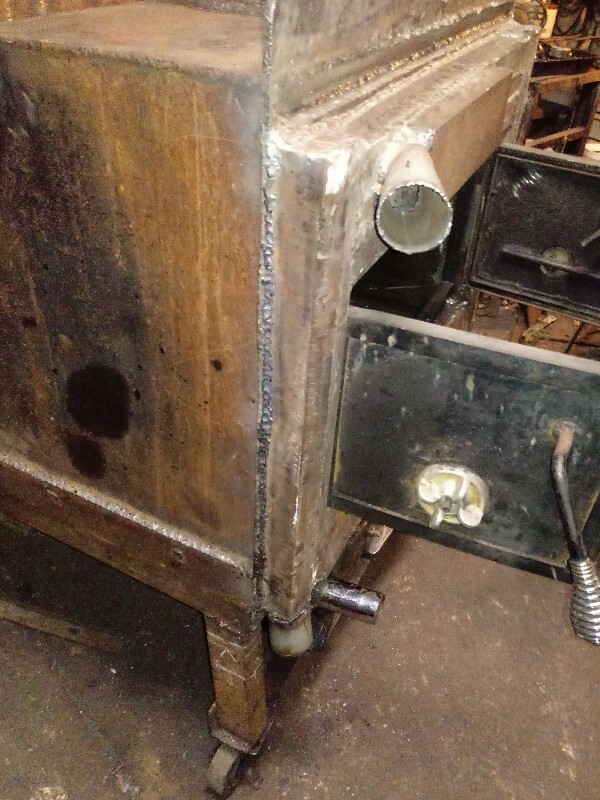 Getting my gasifier heating stove near finished. 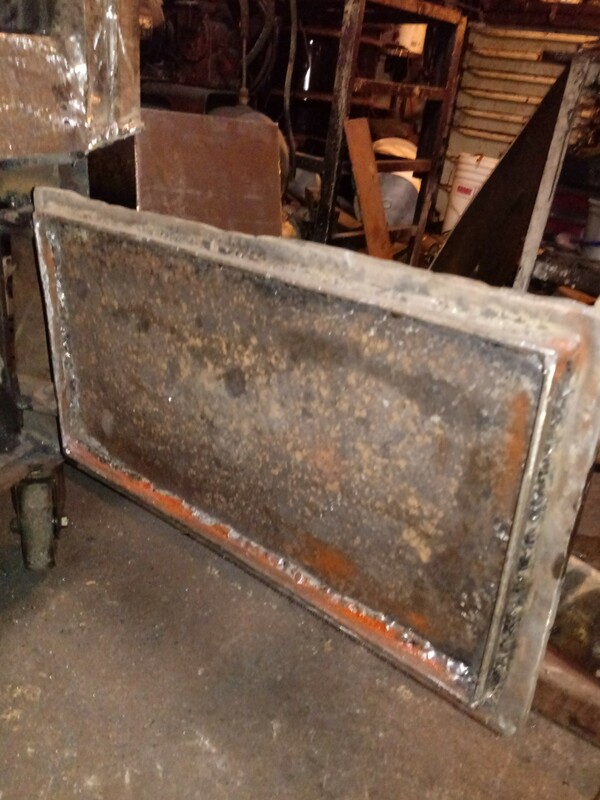 I BUILT this from a 3/16" thick double wall fire place insert wood stove& the heat exchanger is a thick wall plate fuel oil tank from a truck that was 3/16" thick. What Koen said. Make sure we don’t miss first lightup. You put a LOT of thought into that build. 3/16 steel should last a long time. I have never seen a stove on wheels though? 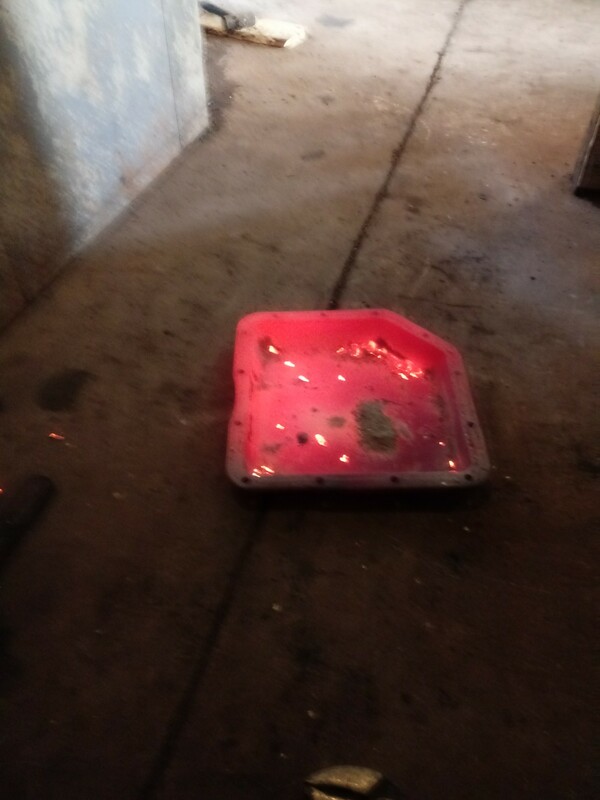 Thanks for the compliments, first light up or second after see how my air deviders are working good between air in the top box and the air added too the bottom box for flame oxegen addjustments.No wheels no deals, hopeing the wheels dont get too hot", if so i will pull the pins and set up on blocks. 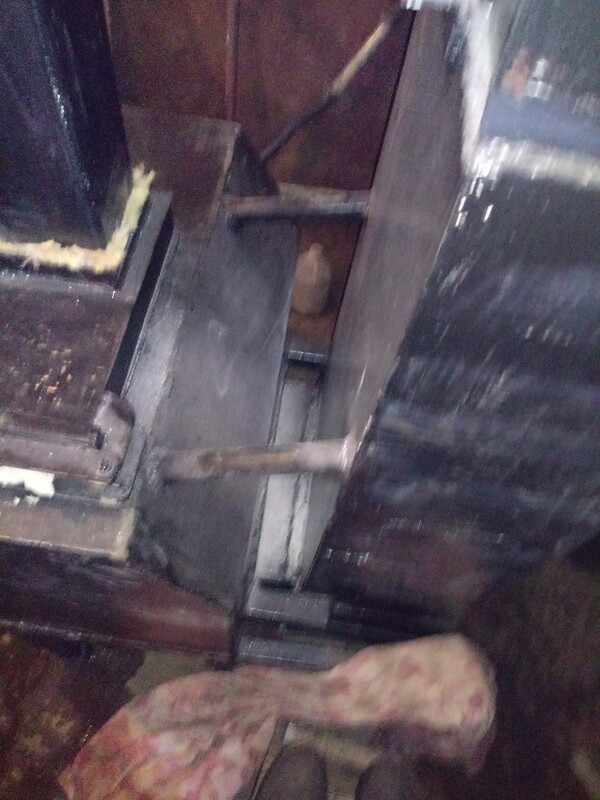 As Garrt T said the whole outfit is too heavy too move with out wheels, i could have built a cart,and slid off, this way is easyer too move if need too make any major repair work.The way it is now it will roll through my 36" doorway and still clear the top.Makeing the final chimney with a closeable damper too day and adding the water pipeing in between the two tanks for heat transfer expanchen.As far as the thinking goes from jan ola, I have a slow hat rack, getting my desiges calculated or pictured, thats whats took so long too finish. wood burner all done except whats missing,ahhh. 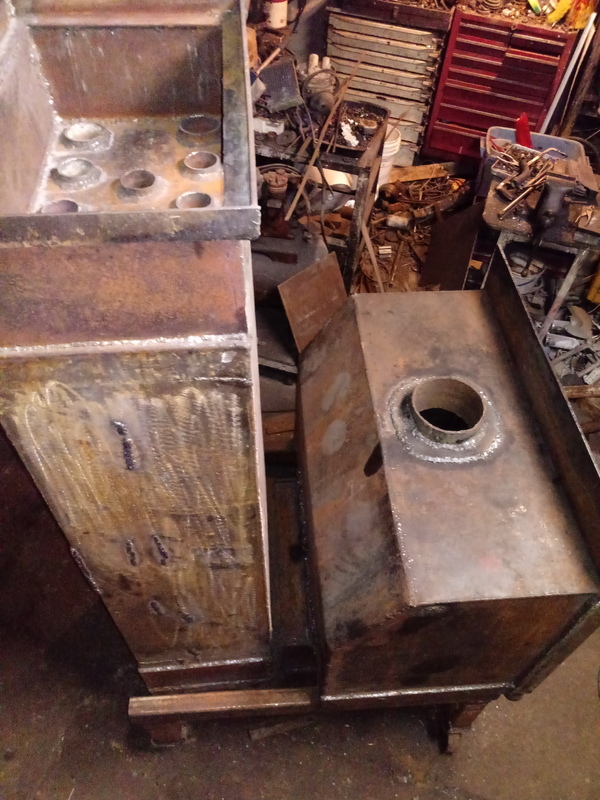 allmost done one chimney flange and remod my air flow a little. 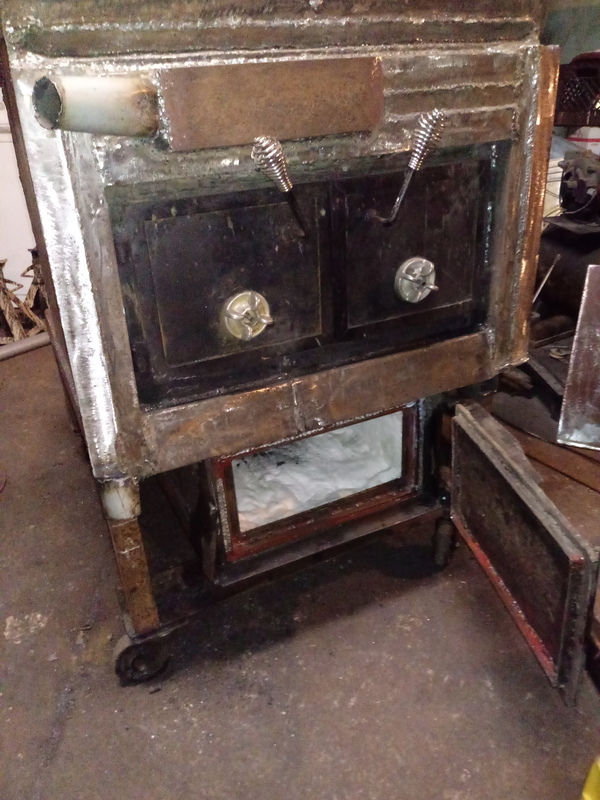 I think the wheels will be fine, stoves tend to be fairly cool on the bottom. At most adding a sheet metal heat shield (1/2" air gap), will protect things below. thanks for compliments, Im glad its about finished, i need too start other projects, Any ideas on how too keep the smoke from rolling out the air inlets once the fans are off for cooling down time’s. ? 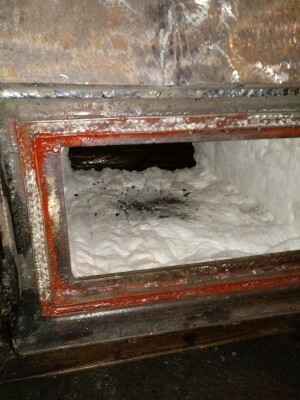 perhaps i could open the flue a little at coasting times. Kevin, I always leave the flue open. I only close the air inlets. Any smoke will be evacuated. Hi tom, i have a week fan, for the job or just need too get hooked too the chimney for extra draft. We been getting the wind here day, 40 too 60 gust off and on gust, steady 40 mph. luckily the power is still on. 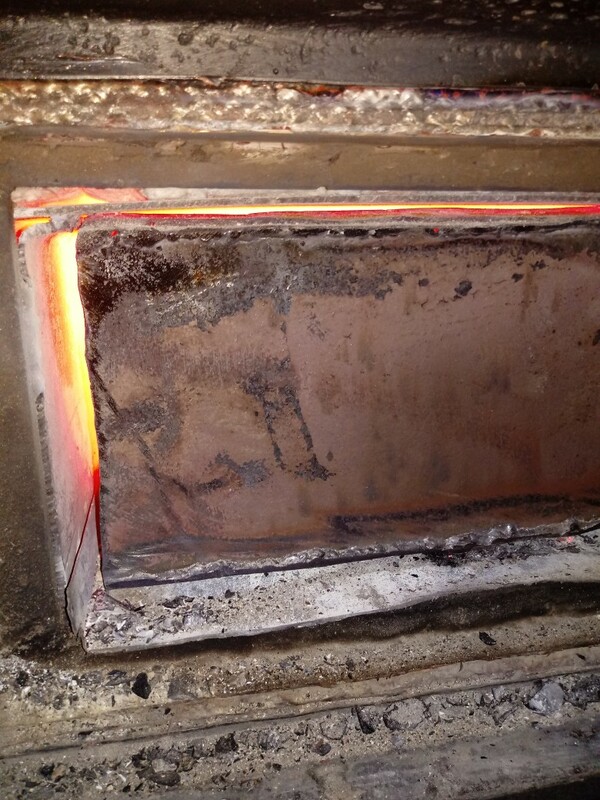 Hi Jo,Are we talking truck or home heating gasifier.Thanks jo. 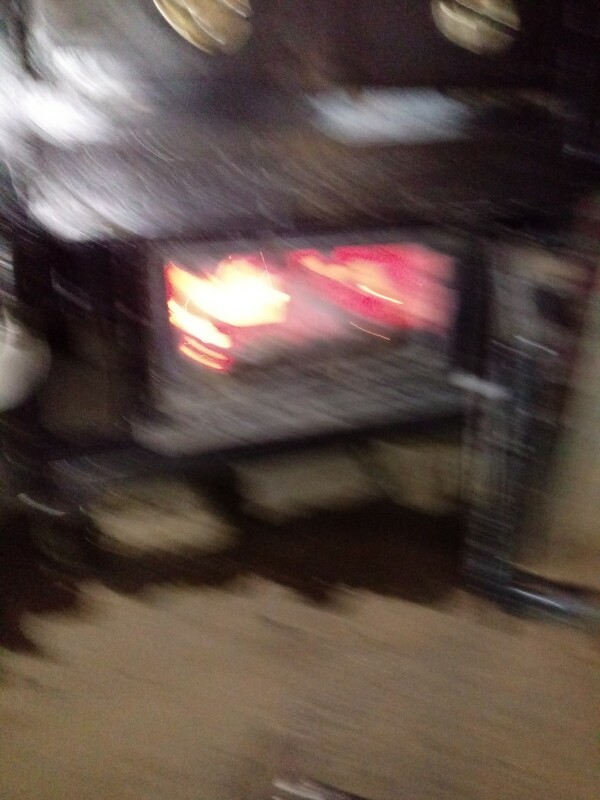 i planed on open the flu only wile running in regular green wood burn, but the flu must be shut too get a flame blowing down in the secondary burn chamber.BBB. when i forse air in the top burn box the flame shoots down in bottom secondary chamber, though the flu for the top burn box has too be closed for these kind too work.the rest of the flu is open, but it dont let the smoke preasure out the bottom flu.I may have too add some air inlet flip valve like some are useing on there truck gasifiers, too keep smoke from entering my garoge when the fore air fan is off. I’m sorry, I didn’t realise you were talking about the flue that by-passes the heatex. I open that one only when I do a hot refill. Of course you could open it a little at shutdown too, to let any smoke out. Another fix would be to have the air inlets piped down low. Mine are about the same hight as the restriction. 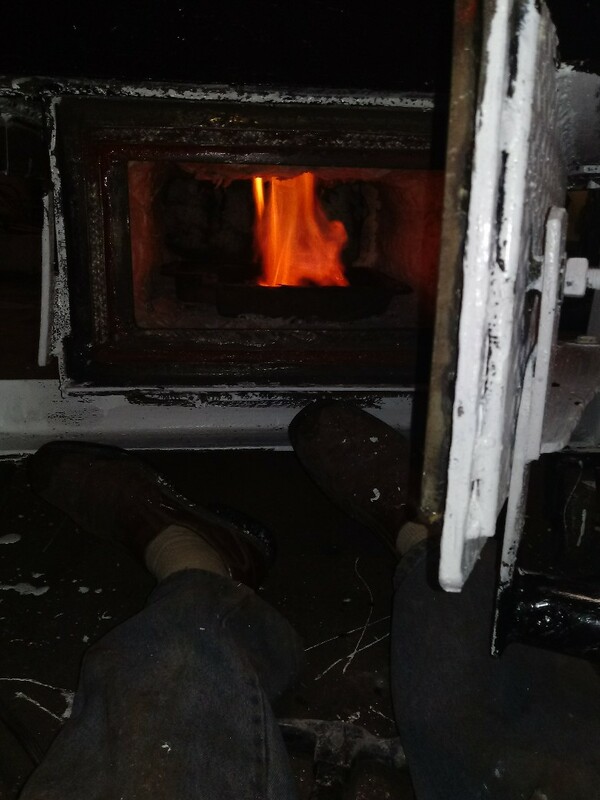 Hopefully when you get things hooked up to the chimney for more draft you’ll be fine anyway. FIRE IN THE HOLE. 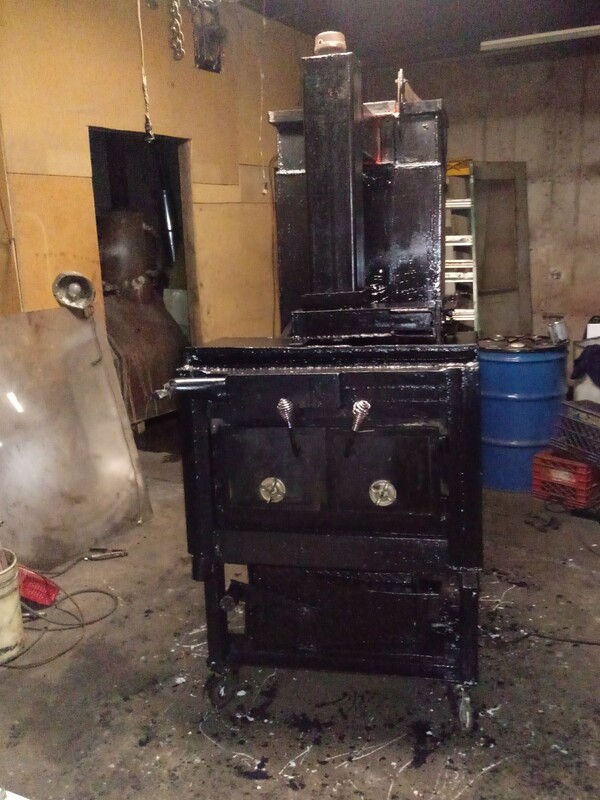 got my gasifier type wood boiler Done FINALY, seems too heat up much faster and 85 % less smoke, or i get about 25 % of what i did with old stye burner. works best with both fans running, the fans are only about 30 watt each anyway. 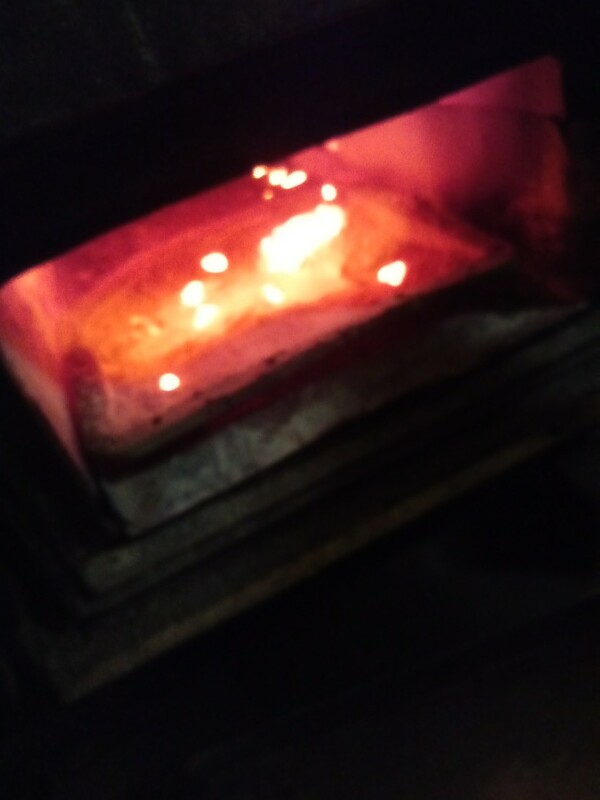 Got my transmission drain pan glowing, took about 1/4 load too get the bottom glowing enough too sustain a flame, as my wood is about 45 % moisture. 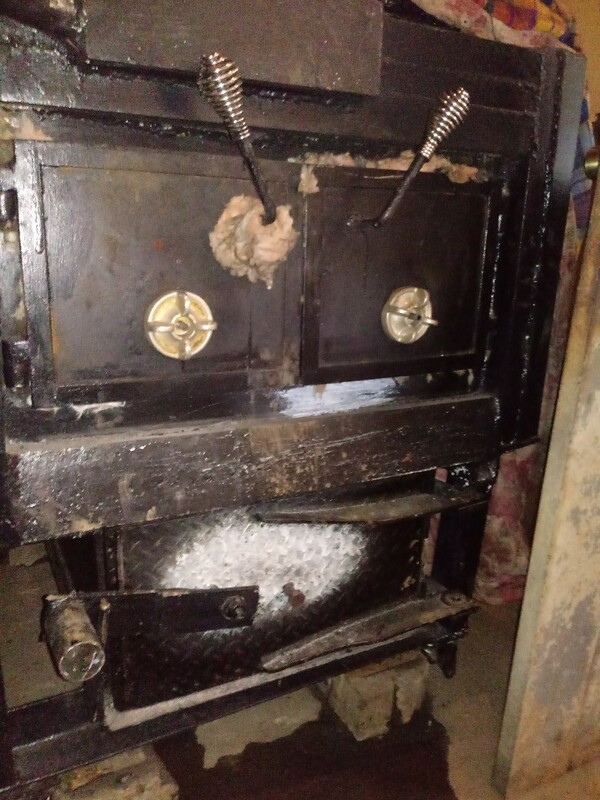 working good after i fixed the top burner doors seal with glass insulation till get new rope seal, the bottom door i built has no leaks at all. 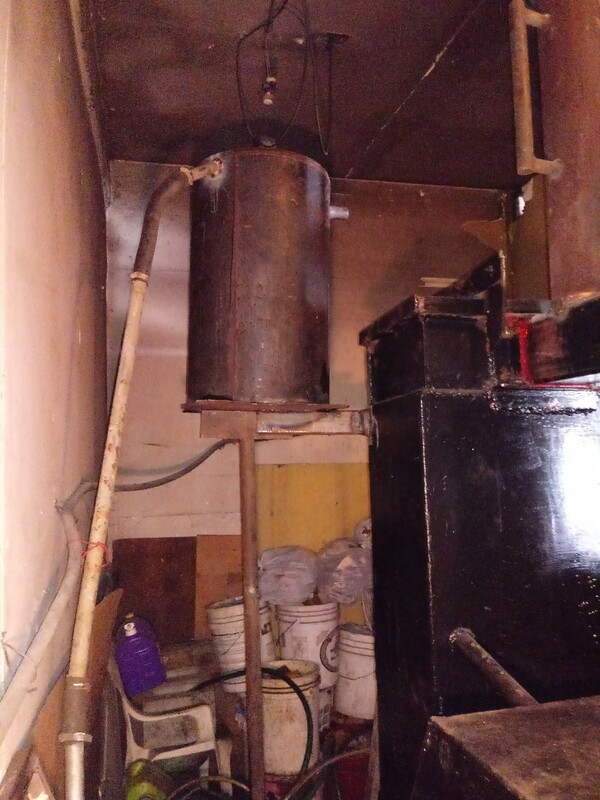 .Got the resivoir water tank installed late last night, my return water line is over 8 feet up, and my dish washer 70 watt pump has been doing the job. suprizing how a 20 % duty cycle pump runs all winter long, some years i use two pumps if the bearings get lould. it wasent easy getting it up on a barrel two milk crates and about 6 blocks of 4×4 and 2×4 board.Thats all for now till i think what i missed typeing.BBB. 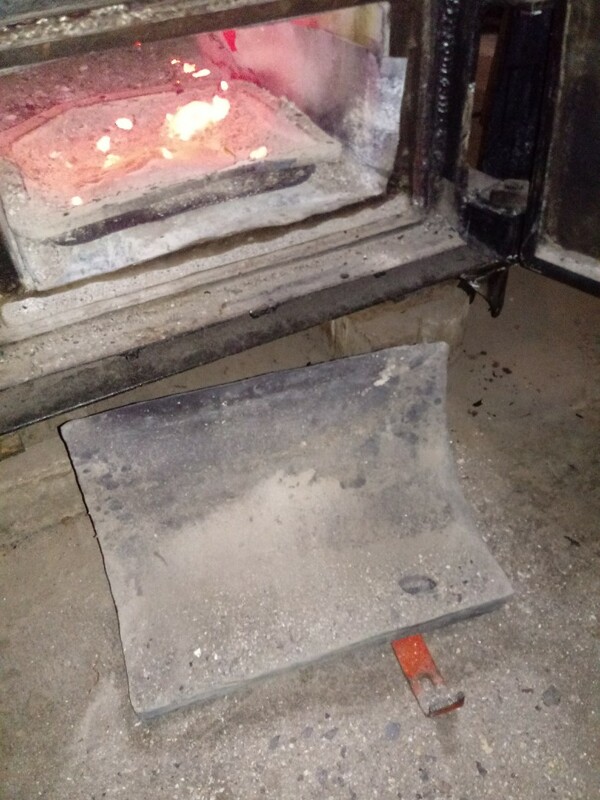 I covered the ceramic insulation with 1/8" ss plate too keep the top insulate up, and dust down, its all glowing in bottom burn chamber, really running clean out chimney.All so i must add that on the other side on the bottom burn chamber and ceramic blanket, outside metal only about 175 too 250 f degrees, so that ceramic is working good keeping the outside temps down. 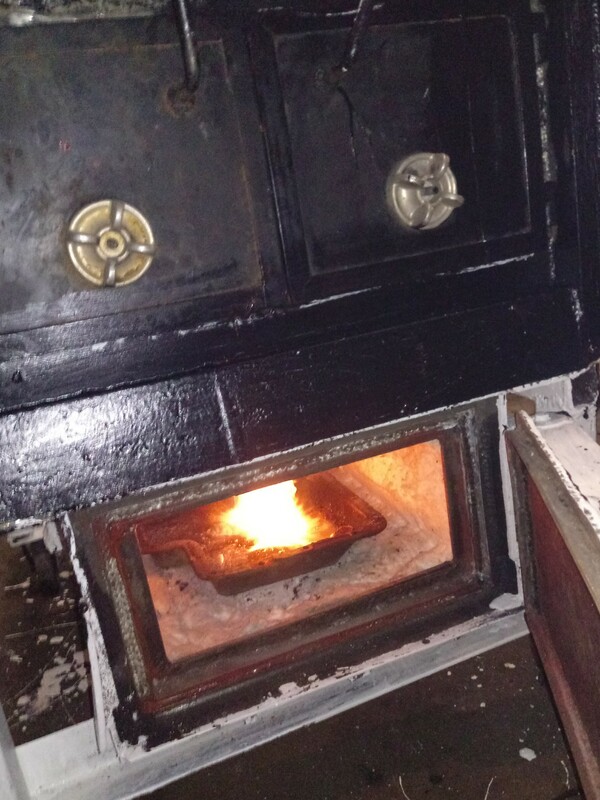 Now that my gasifier type wood boiler is working well. 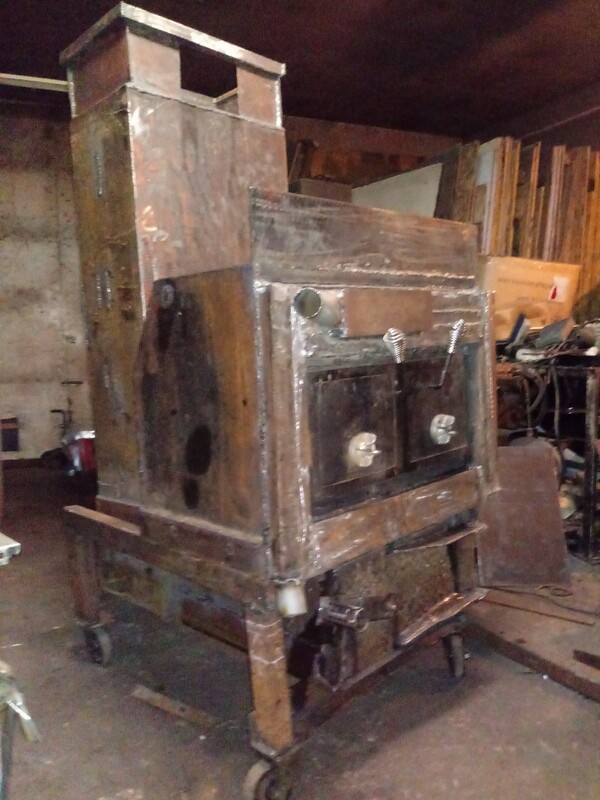 I want too thank WAYNE KEITH for keeping the drive on wood web site rolling along, I could not have built this unit with such direction too complete the project,as was able too,from the wood heating post at other projects, than Drive on wood machines.Thanks WK. 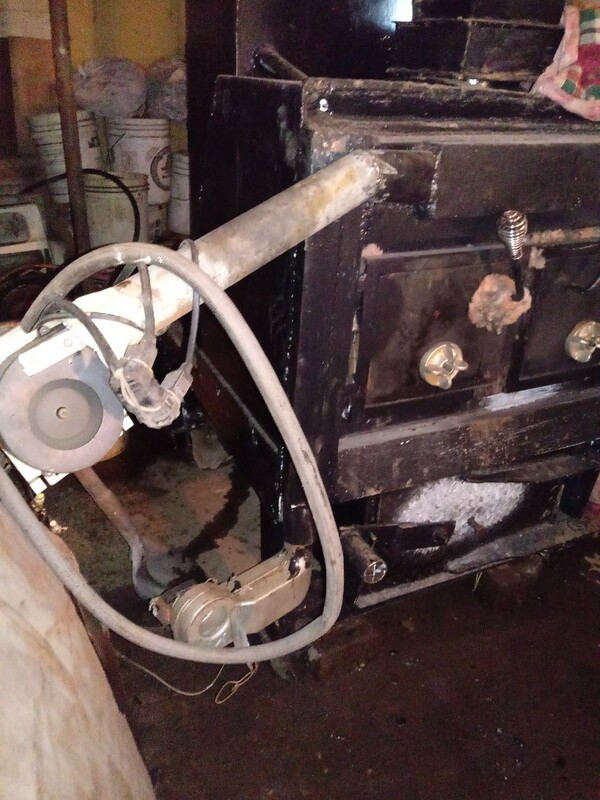 and the other wood heating,gasification, boiler builder post. 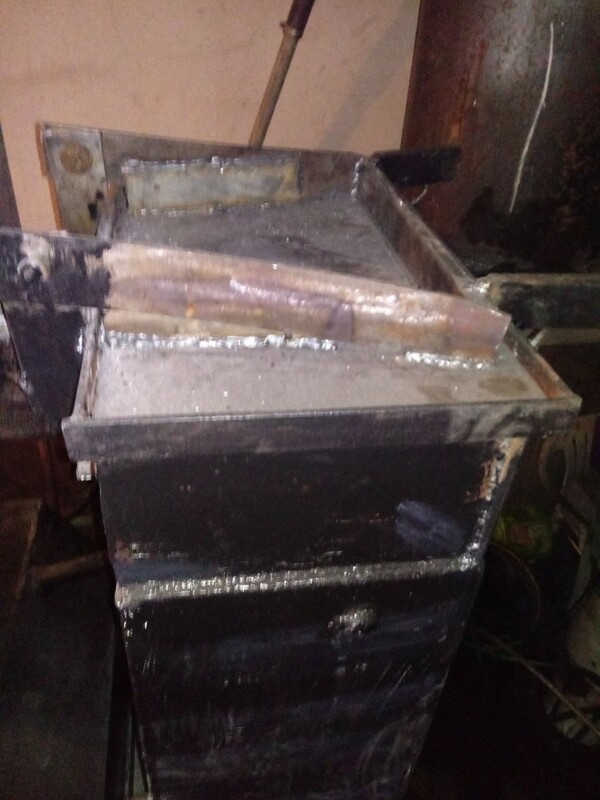 well i couldent help but add one more photo, i through some 50 % moisture wood at best in the wood heater thinking this thing is going too tar up, so after my auto shut off fans stoped, I thought lets see if it looks cold on the bottom secondary bur chamber, no bad luck being cold, the transmissio pan i used as an as pan and glow eliment was red hot and you can see the ramp i built too direct the downward flames away from the bottom clean out door. 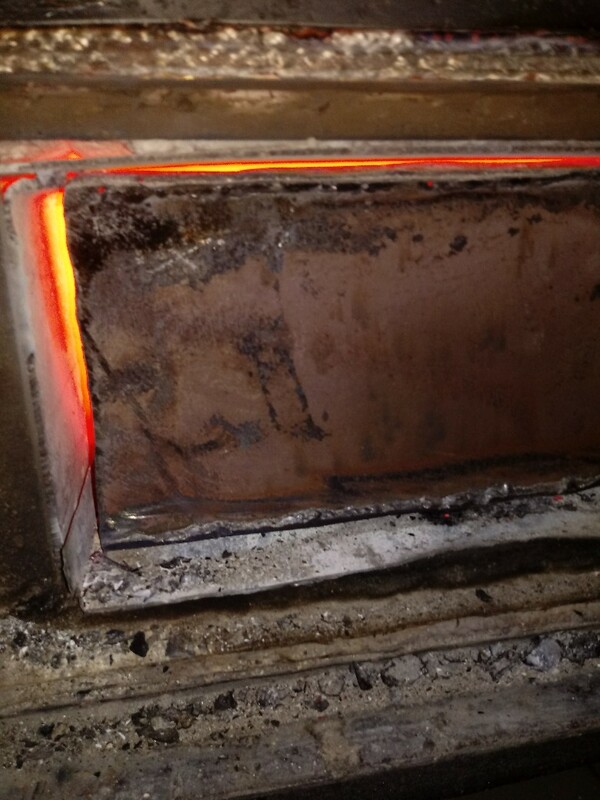 Half of the ramp was glowing red hot along with the trans pan, So i suppose the extra consintrated heat helps reburn the the smoke before it gets away out the chimney. 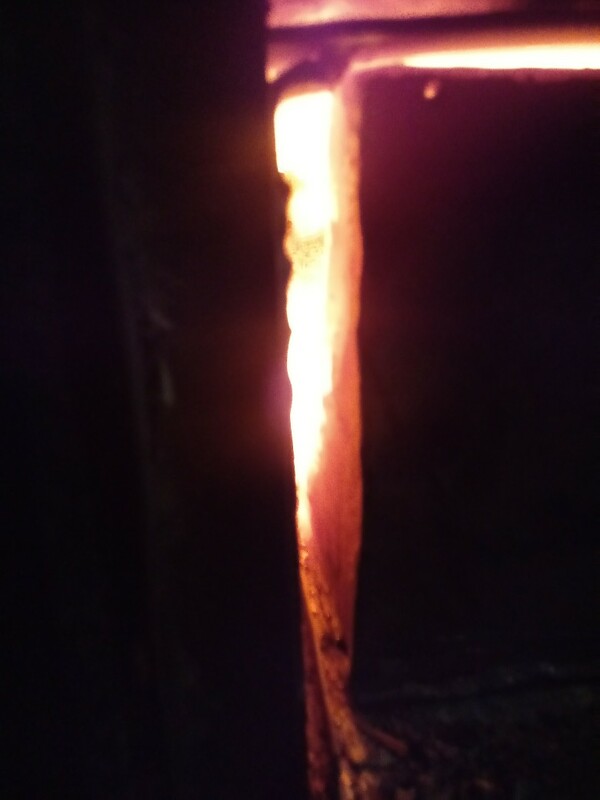 The last photo dont show the red hot parts much due too my camera flash wouldent shut off though it shows the different coulors on the flame ramp and the distortion on the trans pan from serving as secondary glow block.Working good even with 50 % moisture though less water in wood would yeild less chimney smoke.The bottom door seems too be staying steady below 300 f with my flame ramp deverter.